What should you invest in if you are looking to get some silver bullion coins, 1oz American Silver Eagles or 1oz Canadian Silver Maple Leaf? We asked ourselves this question recently and while doing some research this is what we found out. Here are the bare facts so you can do a Silver Eagle vs. Canadian Maple Leaf comparison, and better make an informed decision by yourself. So here we go, here are the details. American Silver Eagle – The face value of this coin is $1.00, but that does not mean it’s worth $1.00 The 1 dollar face value is largely symbolic, and the US Mint sells the coins for $20+ USD. Coin backed by US Mint. 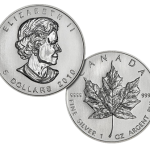 Canadian Silver Maple Leaf – this coin has a face value of $5.00 Can, this coin is backed by the Royal Canadian Mint, and again the face value is largely symbolic, as the coin regulary sells for $20+ USD. 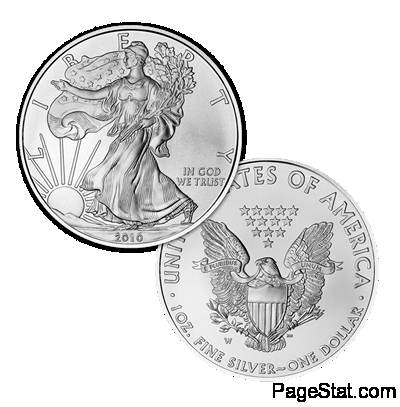 American Silver Eagle – pretty good chance you can find these coins online if you are looking. You will not be able to purchase these at the US Mint as they are almost always sold out due to there demand. website You can buy the coin on Ebay, many online precious metal dealers, and your local coin shop. 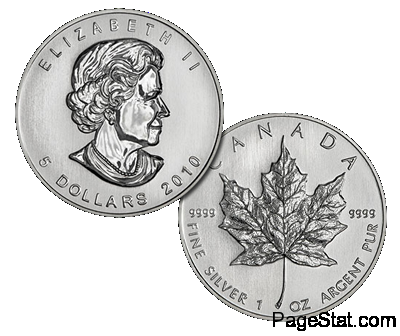 Canadian Silver Maple Leaf – pretty good chance you can find these coins if you are looking to buy some. website They are regularly sold out at certain online and local shops, due to there popularity, but if you aren’t looking for a certain year you are most likely to find them. American Silver Eagle – at the time of this post the coins cost around $22 each, for a decent but non BU coin. Obviously the brilliant un-circulated, or proof coins cost more. Canadian Silver Maple Leaf – at the time of this post the coins cost around $21 each, for a decent but non BU coin. Obviously the brilliant un-circulated, or proof coins cost more. American Silver Eagle – a nice looking coin design that was first minted in November 24, 1986. As far as I know the design has not been modified. You can see from the photo at the top of the page (click to enlarge the photo) that the front contains the image of Walking Liberty, and the back a Heraldic eagle with shield and thirteen five-pointed stars. This is a good looking coin ladies and gentlemen. I am from the USA, so I’m partial while our brothers up north the Canadians did a great job with their design, I still like the American Silver Eagle better, Maybe just a bit of patriotic stubbornness, but I do. Canadian Silver Maple Leaf – This coin is one of the best looking coins I’ve seen in a long time. The coin has been minted and was design in 1988. The design has changed little since it’s conception, but recently was redesigned in 2009 for the 2010 Olympics. The front contains the image of Queen Elizabeth II, and the back has an image of a Canadian Maple Leaf. You may like the way this coin looks better than that of the silver eagle, especially if you are from Canada. American Silver Eagle – this coin is more popular and easier to trade, sell, or barter with in the United States. (big surprise right 🙂 This coin is backed by the US Mint. Canadian Silver Maple Leaf – this coin is more popular in Canada, and most European countries, most likely because of the Queens image. This coin is backed by the Canadian mint. 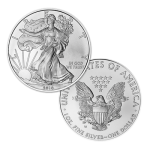 American Silver Eagle – these come in tubes of 20 or monster boxes of 500. Canadian Silver Maple Leaf – these used to come in tubes of 20 but now come in tubes of 25, and monster boxes are still 500. We hope this has helped you make an informed decision as to what you should buy when it comes to picking the perfect silver bullion coin for your collection or investment. We suggest buying one of each. 🙂 You can’t go wrong with both. If anything you can buy a few of each, then look them over for a bit before buying more. This entry was tagged 1oz American Silver Eagles, 1oz American Silver Eagles details, 1oz Canadian Silver Maple Leaf, 1oz Canadian Silver Maple Leaf details, 2010 american silver eagle, american silver eagle mintage, american silver eagle value, canadian maple leaf silver, Eagles VS. Maple Leafs, maple leaf vs silver dollar, should i buy silver canadian maple leafs, should i buy silver eagles, silver canadian maple, silver eagle vs maple leaf, silver eagle vs silver maple leaf, silver eagles vs maple leafs, us silver dollars for sale, value us dollar coins, value us silver coins, value us silver dollars, whats better silver eagles or silver maple leafs by pagestat. Bookmark the permalink.